Cover Story–December 2018: "Treasures! exhibitionism! showmanship!" 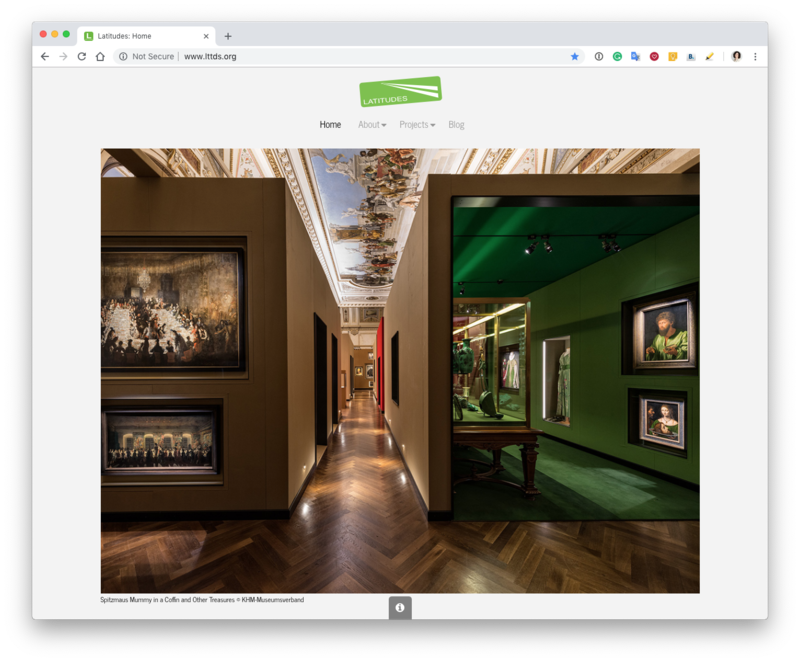 "A clutch of shows in Vienna (where Latitudes was recently a guest of Art Week) and Amsterdam (which just held its Art Weekend) offer a distinctive take on curatorial liberty and creative exhibition display." 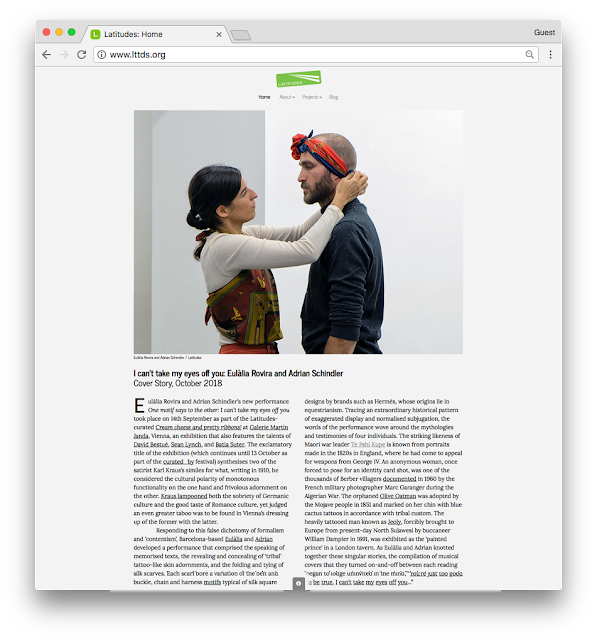 Cover Story—October 2018: "I can’t take my eyes off you: Eulàlia Rovira and Adrian Schindler"
"Eulàlia Rovira and Adrian Schindler’s new performance, "One motif says to the other: I can’t take my eyes off you" took place on 14th September as part of the Latitudes-curated Cream cheese and pretty ribbons! at Galerie Martin Janda, Vienna, an exhibition that also features the talents of David Bestué, Sean Lynch, and Batia Suter. The exclamatory title of the exhibition (which continues until 13 October as part of the curated_by festival synthesises two of the satirist Karl Kraus’s similes for what, writing in 1910, he considered the cultural polarity of monotonous functionality on the one hand and frivolous adornment on the other. Kraus lampooned both the sobriety of Germanic culture and the good taste of Romance culture, yet judged an even greater taboo was to be found in Vienna’s dressing up of the former with the latter." —> After October it will be archived here. 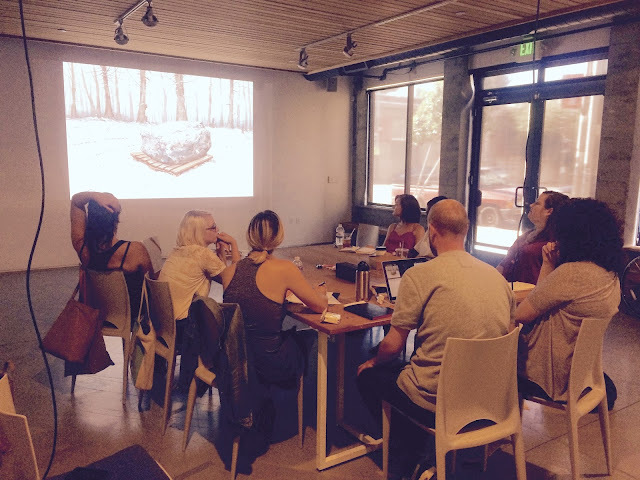 On September 8, 2015, Latitudes led a 3h session with the participants of the first year of the MA in Curatorial Practice at the California College of the Arts (CCA) in San Francisco. This was our last day as residents at the Kadist Art Foundation. As a mode of introduction we presented a range of projects we have worked on and referred to the closed-door seminar ‘The Near-Future Artworlds Curatorial Disruption Foresight Group’, we had led a week earlier with the participation of colleagues and art professionals – an informal dialogue about the future of contemporary art institutions, and more particularly concerned with programming speeds, institutional scale, and periodicity. For the second part of the evening, we split the group in three and asked them to prepare descriptions of hypothetical art organisations and to reflect on urban/ non-urban contexts and mission statements. Work is licensed under a Creative Commons Attribution-NonCommercial-NoDerivs 3.0 Unported License. On 27 November, Mariana Cánepa Luna of Latitudes lectured within the first module of "Case Studies: Curatorial Theory and Practices" within the theoretical and practical seminar "ON MEDIATION. Theory and Curatorial Practices in Global Art" that takes place at the Facultad de Geografía e Historia, Universitat de Barcelona until May 2014. The seminar, organised by the research group Art Globalization Interculturality, offers perspectives around the different modes of working within curatorial practice in a postdisciplinary context. 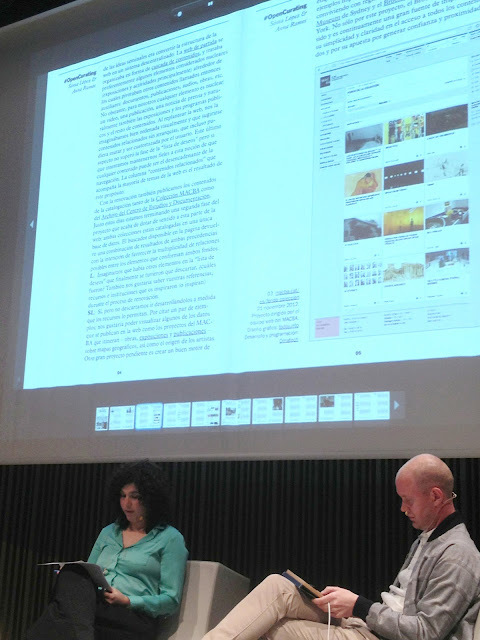 Latitudes presented their curatorial practice, concentrating in four particular projects that reflect the diversity of the roles they have been adopting as curators. See programme details here (pdf of the leaflet in Spanish here). El 27 de noviembre, Mariana Cánepa Luna de Latitudes participó en primer módulo de "Casos de estudio: Teoría y práctica curatorial" que se incribe dentro del seminario "ON MEDIATION. Teoría y Prácticas Curatoriales en el arte global" y que tiene lugar en la Facultad de Geografía e Historia de la Universitat de Barcelona hasta el próximo Mayo 2014. El seminario, organizado por el grupo de investigación Art Globalization Interculturality, identificará modos de hacer que impulsan a la práctica curatorial hacia un escenario posdisciplinar. 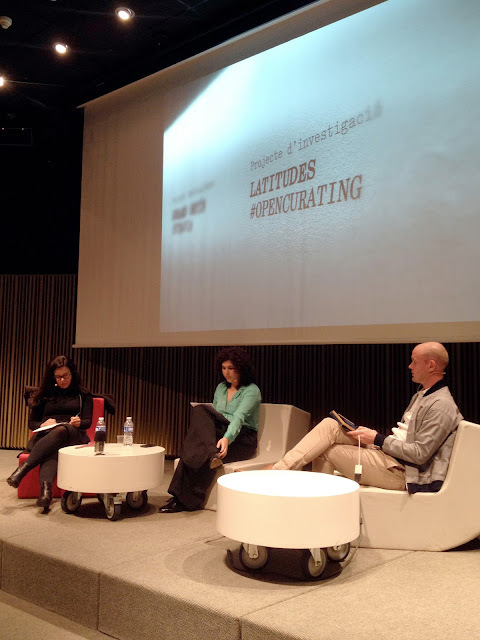 Latitudes presentará su práctica curatorial, concentrándose especialmente en cuatro proyectos realizados recientemente que reflejan la diversidad de los roles y funciones que han adoptado como comisarios. Ver detalles del programa aquí (pdf del folleto here). Yasmil Raymond has been the curator of Dia Art Foundation in New York since 2009. Previously, between 2004–9, she worked at the Walker Art Center in Minneapolis. At Dia she has organised exhibitions and projects with artists including Jean-Luc Moulène, Yvonne Rainer, Ian Wilson, Robert Whitman, Koo Jeong A, Franz Erhard Walther and Trisha Brown. She is currently working on the retrospective Carl Andre: Sculpture as Place, 1958–2010, due to open in May 2014, as well as on Gramsci Monument, a project by Swiss artist Thomas Hirschhorn that begins this July. The published text [available via Latitudes' web on pdf and ISSUU format] is a transcription of a conversation between Raymond and Latitudes that took place on 19 February 2013 at the auditorium of the Museu d’Art Contemporani de Barcelona (MACBA), as the public event of Latitudes’ #OpenCurating research. The conversation begins with an overview of this research, followed by a brief introduction to Dia and its projects since 1974. It incorporates “crowd-sourced” questions that were received via Twitter and Facebook, including from Raymond’s current and former work colleagues, and concludes with questions from the audience. Interview with Yasmil Raymond available via Latitudes' web as a pdf and in ISSUU format. 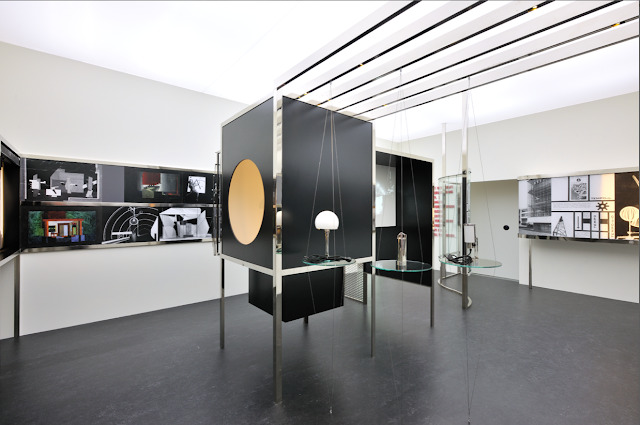 Play Van Abbe, Part 2: Time Machine (10 April–24 September 2010). Curated by Steven ten Thije (guest curator) and Diana Franssen, Curator and Head of Research. Exhibition view of: Raum der Gegenwart, (1930) 2009 scale 1:1, various materials. Installation: 430 x 860 x 610 cm. Collection Van Abbemuseum, Eindhoven, The Netherlands. Photo: Peter Cox, Eindhoven, The Netherlands. As Research Curator at the Van Abbemuseum, in Eindhoven, the Netherlands, Steven ten Thije is part of the team of one the first public museums for contemporary art to be established in Europe. Under the directorship of Charles Esche since 2004, the museum has defined itself through "an experimental approach towards art’s role in society", where "openness, hospitality and knowledge exchange are important". Ten Thije is also a lecturer and researcher at the University of Hildesheim, Germany, where he is studying for a doctorate in the genealogical analysis of the exhibition curator. He was co-curator of the Spirits of Internationalism (Van Abbemuseum, 2012), and alongside Esche, with curators Christiane Berndes, Annie Fletcher, and Diana Franssen, he was guest curator of Play Van Abbe (2011). Subtitled The museum in the 21st Century, this was a four-part multifaceted programme of exhibitions, research and events in which the Van Abbemuseum reflected on the meaning and role of the art museum. Using its collection to articulate questions about the public's reaction to art and its contexts, the Van Abbemuseum probed its own history and purpose alongside how cultural production has reflected the social and political dynamics of the last twenty years. The project is articulated around a series of ten new interviews with curators, artists, writers and online strategists published as a free digital edition [read here the published ones so far], a Twitter discussion moderated around the hashtag #OpenCurating and a finissage event in Barcelona (date TBA). 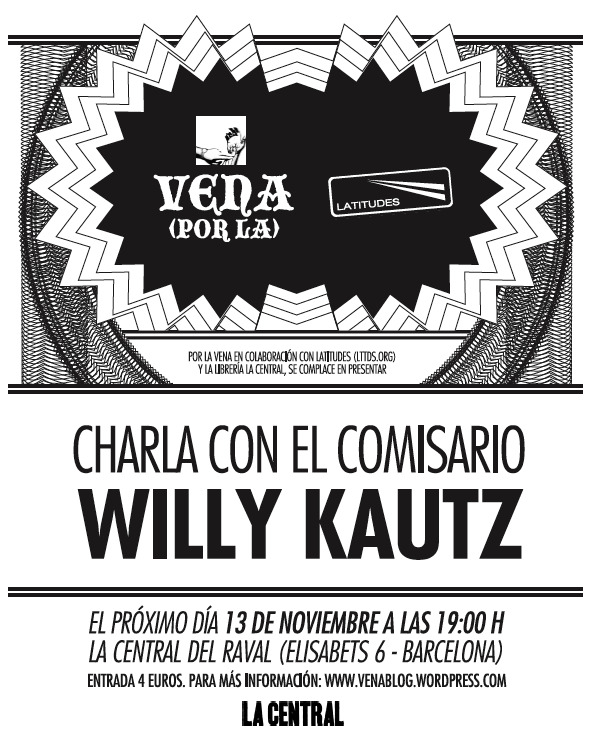 Willy Kautz hablará de su experiencia como comisario en el Museo Tamayo Arte Contemporáneo en México D.F. (2001–4) y se centrará en su último proyecto, la exposición colectiva 'Yo uso perfume para ocupar más espacio' inaugurada recientemente en el Museo Carrillo Gil (7 octubre 2009 – 3 febrero 2010) que cuenta con la participación de los artistas Gabriel Acevedo Velarde, Daniel Andujar & Rogelio López Cuenca, Julieta Aranda, Carles Congost, Ximena Cuevas, John Bock, Dustin Ericksen & Mike Rogers, Paul MacCarthy, José Clemente Orozco y David Alfaro Siqueiros – imágenes exposición. Willy Kautz (1975) fue comisario del Museo Tamayo Arte Contemporáneo, México D.F. 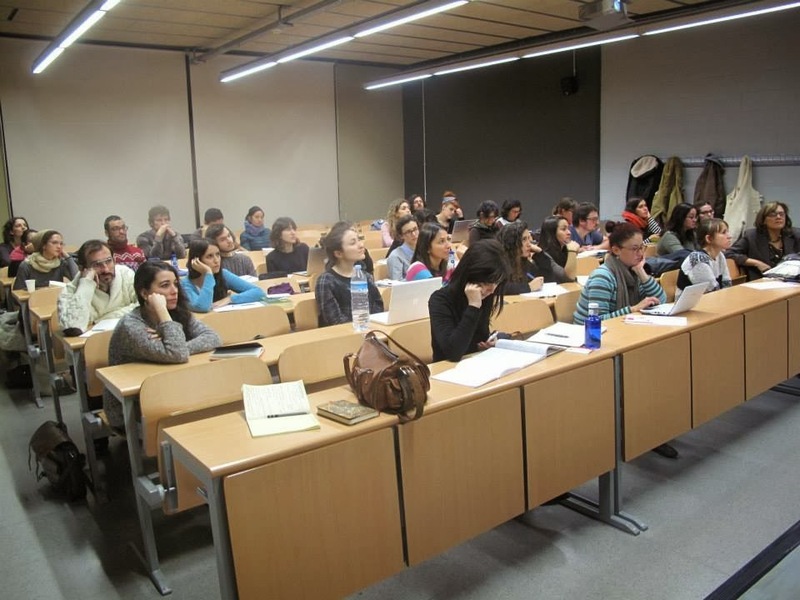 (2001-4) y desde el 2006 está cursando un doctorado en estética en la Universitat Autònoma de Barcelona. Entre sus exposiciones destancan: "Cuasi-corpus. Arte concreto y neoconcreto de Brasil", Museo Tamayo Arte Contemporáneo, México D.F., MARCO, Monterrey, México (2002); "Gordon Matta-Clark: proyectos Anarquitectónicos", Museo Tamayo Arte Contemporáneo, México (2003); "Mira Schendel Continuum amorfo", Museo Tamayo Arte Contemporáneo, México D.F., MARCO, Monterrey, México (2004); "Simplesmente elas exalam", Galería Leme, Sao Paulo, Brasil (2005); co-curador de "Transitio_MX, Festival internacional de artes electrónicas y video 01, Imaginarios en tránsito: poéticas y tecnología", Centro Nacional de las Artes, México D.F. (2005); "Yo uso perfume para ocupar más espacio", Museo Carrillo Gil, México D.F. (2009). (*) Vena (porla) y Latitudes organizan esta serie de charlas sin ánimo de lucro. La compra de tu ticket se invierte íntegramente en la realización de futuras presentaciones. Gracias por tu colaboración.